Contents. List of Contributors. Introduction to the Series (A.M. Tartakoff). Preface (H. Plattner). Part A. Involvement of the Trans-Golgi Network, Coated Vesicles, Vesicle Fusion, and Secretory Product Condensation in the Biogenesis of Pseudomicrothorax Trichocysts (R.K. Peck, B. Swiderski, and A. Tourmel). Early Steps of the Secretory Pathway in Paramecium: Ultrastructural, Immunocytochemical, and Genetic Analysis of Trichocyst Biogenesis (N. Garreau de Loubresse). Calcium and Trichocyst Exocytosis in Paramecium: Genetic and Physiological Studies (J. Cohen, and D. Kerboeuf). Exocytic Events during Cell Invasion by Apicomplexa (J.F. Dubremetz and R. Entzeroth). Pathways of Lysosomal Enzyme Secretion in Tetrahymena (A. Tiedtke, T. Kiy, C. Vosskuhler, and L. Rasmussen). Synchronization of different Steps of the Secretory Cycle in Paramecium Tetraurelia: Trichocyst Exocytosis, Exocytosis-coupled Endocytosis, and Intracellular Transport (H. Plattner, G. Knoll, and R. Pape). The Ciliary Membrane and its Engagement in Conjugation (J. Wolfe). Ciliary and Plasma Membrane Proteins in Paramecium: Description, Localization, and Intracellular Transit (Y. Capdeville, R. Charret, C. Antony, J. Delorme, P. Nahon, and A. Adoutte). Part B. Endocytosis and Intracellular Transport of Variant Surface Glycoproteins in Trypanosomes (M. Duzenko and A. Seyfang). A Comparative Survey on Phagosome Formation in Protozoa (K. Hausmann and R. Radek). 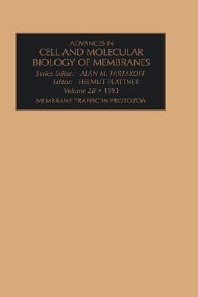 Enosomal Membrane Traffic of Ciliates (R. D. Allen and A.K. Fok). Membrane Flow in the Digestive Cycle of Paramecium (A.K. Fok and R.D. Allen). Signal Coupling during Endocytosis in Amoeba Proteus (R.D. Prusch). Membrane Recycling and Turnover in Large, Free-Living Amoebae (K.W. Jeon). Food Uptake and Digestion in Amoebae (W. Stockem and M. Christofidou-Solomidou). The Lysosomal System in Malaria Parasites (C. Slomianny). Membrane and Microtubule Dynamics in Heliozoa (T. Suzaki and Y. Shigenaka). The Host-Symiont Interface in Ciliate-Algae Associations: Inhibition of Membrane Fusion (W. Reisser). Lipid Composition of Membranes Involved in Membrane Traffic in Tetrahymena (S. Umeki and Y. Nozawa). Index. Membranes are highly dynamic and operate not only as inert boundaries, but the packages they carry around in a cell are well addressed fro appropriate delivery. This holds for a variety of endomembrane systems engaged in exo- and endocytosis, for organelles along the biosynthetic pathway, phagosomes, and lysosomes. It also holds for the establishment of functional surface properties. Cell pairing (conjugation) phenomena are a good model for the problem of how a cell can discriminate between "self" and "non-self". On the other hand parasitic sporozoa developed to experts in masking their molecular sur-"face"by frequent shedding of their variant antigens. The discovery of their glycosyl-phosphatidylinositol (GPI) anchor has led to the discovery, in polar epithelial cells, of a specific targeting mechanism for GPI-anchored surface glycoproteins. Over one hundred such proteins have been detected in metazoans since then. Many of these basic aspects are dealt with in this book using quite different methodical approaches. Of course, there are many more aspects previously known from metazoan systems and such aspects then had to be verified also for Protozoa systems and such aspects then had to be verified also for protozoa. In this context, it is fascinating to see how basic cellular functions are maintained - with variations of the basic theme - throughout evolution. However, sometimes cell biologists dedicated to work with protozoa have to live with a regrettable phenomenon. Colleagues working with "higher" eukaryotic cells are frequently unaware of the fact that the primary input may have come from work with protozoa. Some phenomena may even be rediscovered inadvertently. In this sense, this book should address not only colleagues working with protozoa but also many of our fellow cell biologists working with metazoan cells.